Tiana, a priestess, has her own fears about being a HeartMate. She’s watched her friends struggle with such a stormy destiny. She’s sure her HeartMate has never claimed her due to a terrible scandal involving her Family, and she’s set aside hopes for love. Antenn’s gotten the commission of his life. The cathedral will make him famous, but more, it will last for ages and prove to others he can contribute to Celta…if the controversial structure isn’t destroyed while being built. Tiana, too, is an integral part of this process, but the villain who wrecked her Family is ready with firebombs. Can they trust each other in dangerous circumstances to succeed…and to love? Marlene: Owens’ Heartmate series is an auto-buy for me; as soon as I finish one, I start counting down until the next. 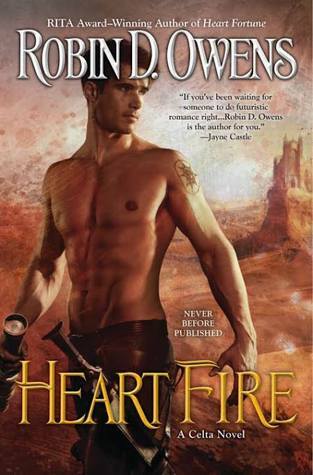 However, Heart Fire is the thirteenth book in the Celta series, and I’m not sure that it wasn’t an unlucky number. I read Ghost Layer (review here) in the same weekend that I read Heart Fire, and I liked the new series better. 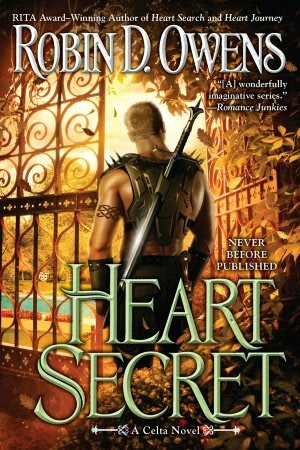 Not that I didn’t enjoy Heart Fire, because I certainly did, but because the Ghost series felt fresh and new, and the story from Heart Fire contained a whole lot of stuff we’ve seen before. It felt like it was finishing off the unfinished business from several earlier stories, especially Heart Choice and Heart Secret. E: I have followed Owen’s Celta series for about 13 years now and while I haven’t liked them all equally, I look forward to each new installment. Another reviewer on twitter asked if I had read it yet last week and when I said it was still on the list, she wanted me to hurry up and read it because she was sure I would really enjoy it. And she was right. Marlene: The central couple in this particular story consists of two people who were severely wounded as children, and have spent their adult lives attempting to cope with the resultant loss of status and self-esteem. Because both Antenn and Tiana have self-worth issues, they both find reasons to delay their heart mate bond in favor of continuing to build up their careers. And of course that’s the wrong way to go. E: I felt Owens reinvigorated this series by mixing two people, familiar to the series, haunted by their childhood, unusual Fams, and ambition into an exciting story. Antenn and Tiana both wanted to prove to Celtan high society they belonged inspite of society’s negative opinion based on other people’s actions. Even as they denied any interest in finding their heart mates the attraction between them was unmistakable even as they discovered they had a common enemy. Their journey as they dealt with the emotional pains of the past and created a future was moving and aided by some other familiar characters. Marlene: Tiana Mugwort is one of the priestess of Celta. It’s kind of a public service office, and she hopes to rise in her profession. It’s not just that she’s ambitious, but that her public acceptance as an important member of the established religion might go a long way towards wiping out the unfair stain on her family. Her family lost their home and their place when a unscrupulous noble used her mother’s membership in an alternate religion to whip up a mob. (Story in Heart Secret). Tiana has never found justice for what happened, and she carries a lot of unresolved anger at the attack and at her parents’ continued unwillingness to fight for their rights. Unless she finds a way to resolve all the baggage that she is carrying around, Tiana will not be able to advance further in her career. In order to help and understand others, it is necessary that one understand and accept oneself first. E: Tiana, a priestess, really wanted to follow a path to become the next High Priestess but she never dealt with her anger over what happened to her family and the continuing negative impacts to include a feeling of abandonment. Watching her start to stand up for what she felt instead of forcing all of her emotions down under a layer of religious serenity was entertaining. Each time she got mad I cheered and when she finally decided to take action I let out several mental cheers. Marlene: Antenn Blackthorne-Moss is just as messed up as Tiana. His brother was killed for dabbling in Black Magic and assassinations, and Antenn spent a lot of time just trying to survive another day. 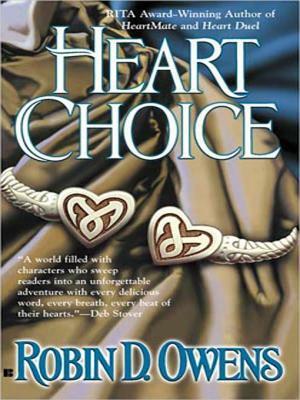 But his budding architectural talent brought him to the attention of designer Mitchella Clover, and when she married into the nobility, he became the adopted son of one of the noble houses (Story in Heart Choice). Now Antenn is a master architect in his own right, and has been commissioned to design and build a cathedral for that same offshoot religion that includes Tiana’s mother. Antenn believes that creating this grand building will cement his reputation as an architect and make his fortune. If it gets built. E: Antenn, a brilliant architect, felt like he was still considered the street kid with bad blood whose brother attempted to murder the entire NobleCouncil. As a result he really wanted to succeed in his new commission to design and build a new cathedral leaving his mark on Celta for all to see. He wasn’t prepared to deal with pent up emotions, sabotage, and someone who shared a traumatic past with him. Marlene: So Tiana and Antenn’s past brings them together. Tiana’s superiors assign her as the liaison between the new religion and the established one, which puts her directly into contact with architect Antenn. Neither of them is looking for a relationship, they are both much too invested in their careers. But there is a third party involved who wants to make sure that their potent physical attraction burns through their resistance (and possibly the sheets). The Turquoise House is newly sentient, and it has decided that Tiana and Antenn will be its family. All it has to do is get them to acknowledge that they are heart mates and are better off together than apart. E: Wounded characters aren’t anything new in this particular series but for some reason these two resonated more with me than some of the more recent couples. I loved their tension and unresolved separate issues which ended up overlapping. I also found the combination of each needing to deal with a desire to prove themselves yet refusing to make their point at the cost of hurting other innocents said a lot about who each was. Turquoise House was one of those hurting characters who knew what he wanted but unfortunately didn’t quite know how to be patient. I have enjoyed its development into a Residence and wonder how many other baby Residences are waiting for their Families to arrive. Marlene: I don’t think this couple resonated with me quite as much as they did my colleague. I was very, very happy to see both Antenn and Tiana’s stories get resolved into a happy ending, but this entry in the series just wasn’t as much fun for me as some of the more recent ones like Heart Fortune and Hearts and Swords. However, I loved that the Turquoise House finally got itself a family. Watching a house “grow up” in the last several stories has been terrific fun. E: I also LOVED the nonstandard Fams. Antenn’s Fam Pinky started off as an ordinary cat but somehow over the course of several years was able to achieve Fam status. He was rather spoiled and soft because he was the first thing to ever care about Antenn and as a result wanted for nothing. Tiana’s Fam on the other hand came from the street like Zanth from HeartMate but unlike Zanth he was well known and feared by all of the other Fams. The Fams were such a contrast to their humans with Pinky calming and stablizing Antenn, while Felonerb brought the spirit of a fighter to Tiana. Marlene: I always love the fams in this series, and Pinky and Felonerb were definitely no exception. Felonerb is such a scamp! I’m not sure he’s quite as streetwise as he pretends to be, but he is a scrappy survivor, and that spirit; his willingness to take on whatever life threw at him and claw it into submission if necessary, was something that Tiana definitely needed. E: On top of the personal difficulties Antenn and Tiana faced, they also had to deal with fanatics who were trying to use religion against the cathedral and Tiana’s family. This was against one of the central Celta beliefs but until it was proven the fanatics intolerance caused harm nothing other than banning from ceremonies could occur. On the other hand, the leaders of the new cathedral were very insistent only their rites would be used for protection, stability, and blessing on the structure and grounds as a reaction to the fanatics. Juggling the religious tensions and their pasts made them want to delay admitting any personal feelings even more since they thought feelings would just distract them for their ambitions. Marlene: I did enjoy the political wrangling, in an ironic sort of way. While most of the parties had the best of intentions, their squabbling reminded me of academia, a kind of political maneuvering that often fights over small victories. That this story showed a different type of religion for Celta was neat and showed their development as a society. It feels realistic that humans have created more than one type of worship. Third hand, I figured out who the big bad was very early on, and he was a bit “over the top” in the villany department. He was so obvious I couldn’t figure out why it took people so long. E: I thought the scenes where both Tiana and Antenn worked through their issues together and decided to journey together were very well done. Owens showed how changing and opening up was not easy – especially after a lifetime of denying what they felt. Turquoise House also had to do some growing up and realize that he wasn’t infallible when it came to dealing with people. Heart Fire brought in several threads from a variety of previous stories, tying the past to the present. While you could start with this story, I highly recommend you start from the beginning of the series to fully understand the changes in Druida City’s society to allow this story to happen. I had a lot of fun seeing how some characters to include a Residence were progressing and glimpsing updates on others. I have an urge to go back and re-read the entire series while I wait to see how this generation is going to continue moving Druida City forward from the power abuses of the past. Marlene: Heart Fire reminded me a bit of Heartmate, where scrappy survivor finds true love with a lady he thinks is above him. For me, that’s not a good recommendation, as I didn’t like Heartmate the first time I read it, and only got into the series on the second go, after I’d read a couple of the other books. I still love this series, and the author’s creation of the fascinating and multi-layered world of Celta, and I’m up for more adventures here. If you like futuristic romance, taking the trip to Celta is definitely worth your reading while.